The public editor for the New York Times (ie: ombudsman) has an interesting piece on the negative consequences of search engine optimization. What’s search engine optimization? In a nutshell, it’s a series of techniques web publishers can take to push their articles toward the top of search results from search engines like Google and Yahoo. Some folks swear by it as a way to increase web traffic, while others argue that it clutters the interwebs with useless info. SEO kind of like war. It doesn’t decide who deserves to be number one. It just determines who has the most power to force their way to the top. Anyway, love it or hate it, SEO seems to work in some cases. And the New York Times has recently embraced it as a way to push New York Times content via search engines. In ways, this is a good thing. It will help drive up the paper’s web traffic, which in turn will help pump up online revenue, allowing the paper to survive in an age when print newspapers are struggling. And after all, it is the paper of record, right? So you’re more likely to get authoritative content by clicking on a Times article than by clicking on Bob’s Blog. Right? Well, the thing is, no newspaper gets it right all the time. And no newspaper follows every story forever. 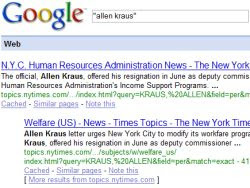 So if you’re a guy like Allen Kraus, you might not be too happy to see a New York Times article as the number one Google search result for your name. Because the Times wrote an article back in 1991 that implicated your resignation from a government post with a fraud investigation. It later came out that Kraus’s resignation had nothing to do with the scandal. But you wouldn’t know that from the article. Sure, this sort of stuff happened all the time before the Times started using SEO. But it raises the question, if you’re going to try to promote your articles in this way, do you have an obligation to make sure they’re accurate? That’s what New York Times public editor Clark Hoyt asks in his article. The answer’s not entirely apparent. On the one hand, you don’t want to muck around with the historical record by changing old articles. But when the paper has clearly followed up on an article and shown that there was incorrect information, is there a way to bundle the update with the original article? In fact, in this way, the internet offers something that’s always been missing from print news. A small retraction published a day, week, or month after the original article means next to nothing in newsprint. Unless it’s a huge story, it’s hard to undo the damage dealt by the initial story. Websites have always been malleable. All you have to do is post an update at the bottom of the page, or better yet, the top. No need to erase the original article. Just keep it up to date with the latest information. Of course, not every article was followed up, and there’s the question of whether the Times or any other paper should be held responsible for checking out every complaint lobbied by people like Allen Kraus now that erroneous articles are topping Google’s search results. Of course, that all takes an awful lot of human powered work to fix. Which is why it’s unlikely it will be fixed anytime soon. But it also lends some credence to Robert Scoble’s argument that the future of search may rest in sites like Mahalo, Techmeme, and Facebook.